The first-person shooter was born to be played on a PC, with a mouse and keyboard. Then along came consoles, and things had to change. The SplitFish FragFX Shark is trying to change things back. Designed for the PS3 (but also compatible with the PC and Mac), the Shark is a great idea for a tiny, dedicated niche of PlayStation 3 owners who do nothing but play first-person shooters all day. For everyone else, it's more trouble than it's worth. For a few years now, SplitFish has been trying to bring the accuracy of a mouse to PlayStation 3 gaming with its FragFX controller setups, and the Shark is the latest in this line. It consists of two controllers: a mouse and a "nunchuk", similar to that you'd find for the Wii or PlayStation Move (it's even got its own gyroscope for motion control, just like the DUalShock 3). There's also a small USB dongle that you insert in the PS3 (or PC/Mac, if you're short a mouse) so that the devices can communicate. The Shark is a cinch to use on your PS3. You plug in the USB dongle, turn on both controllers and you're off. The "nunchuk" is essentially the left half of a regular DualShock, with an analog stick (which handles player movement) and trigger buttons, while the movement of the mouse takes up the role of the right thumbstick (which is how you look around and aim). The mouse buttons replace a DualShock's triggers, while the PlayStation's face buttons (X, O, etc) are tucked away on the inside, near the user's right thumb. The only hassle comes in playing different games; the Shark's sensitivity can differ from title to title, so you have to adjust each game's settings accordingly. In many ways, it works as advertised. When playing Killzone 2, aiming felt smoother and more precise than with a regular controller, as did the important task of snapping between regular aiming and a "down the sights" view (accomplished with a click of the mouse's scroll wheel). It was also a joy using the mouse to control the cursor in the PS3's web browser, making it far easier to use than with a standard controller. It's just so...convoluted. To use the shark effectively, you have to re-learn everything you instinctually know about first-person shooters. The concept of what a trigger does, what a click of the right thumbstick accomplishes, etc is so hard-wired in our gaming consciousness that it takes a lot of hard work to use a different scheme. And I don't think the slight improvements in aiming speed are worth that hassle. Both controllers also feel cheap, especially the uncomfortable mouse, which is disappointing for a setup that costs USD$90. If you do nothing with your PlayStation 3 but play first-person shooters, and are willing to put in the time and effort needed to master a new control scheme, then the Shark will be worth a look. But seeing as it's over-priced, tough to master and is of limited use in other genres, for most people there's not much to recommend. 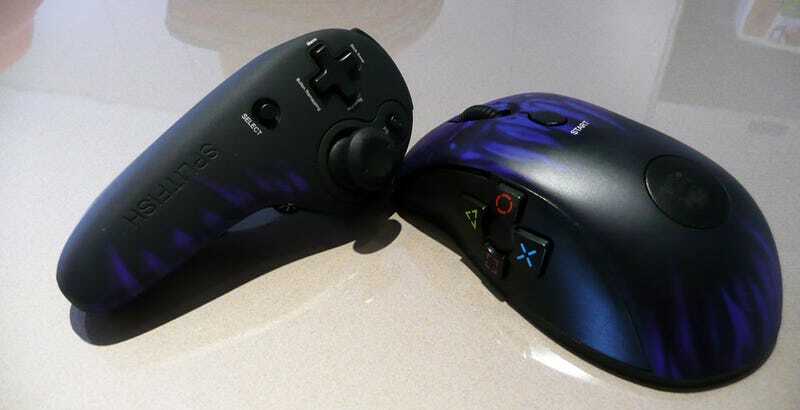 The FragFX Shark was developed by SplitFish for use with the PlayStation 3, PC and Mac. Retails for USD$89.99 and released in Fall 2010. A device was given to us by the manufacturer for reviewing purposes. Tested on PlayStation 3 using Killzone 2, Uncharted 2, XMB and web browser.